Finally we made it to this huge Indoor Playground in Prague - Cestlice, close to the famous Aquapalace aqua park. And…. spent a fortune there; what looked so innocent at the beginning turned out to be quite an investment. Yet this is one of the 2 biggest indoor playgrounds in Prague and it’s worth spending a minimum half day here. The playground has both indoor and outdoor attractions over an area of 8000m2. Firstly, if you buy your tickets via their website you get a 10% discount. All you have to do is present the email confirmation to them. I did it on the way there in the car. Easy. Here is the direct link where you can buy the discounted tickets - click on the first option: Individualni vstup (individual entry). Sure kids had so much fun, but this isn’t a place I would go to every week. Seriously, I am not sure how long they can operate like this. Maybe because they are new people like to go and don’t mind the extra charges, but if I compare it to Beckiland where you pay just an entrance fee and all attractions including the go-carts and kids train are free - it seems to me overpriced. We were with 3 kids - so 60czk went every 3 minutes not calculating the food and drinks. Otherwise, the place is fantastic. They have proper, tasty meals, a nice cafe with a big variety of cakes and ice-creams, a fresh bar and lots of space and everything is well maintained. The biggest monkey bars in Europe, around 2000 m3 is the flagship of the fun park. This favourite five-storey attraction consists of many passages, chutes and slides, climbing walls, nets, wading pools with balls and more. 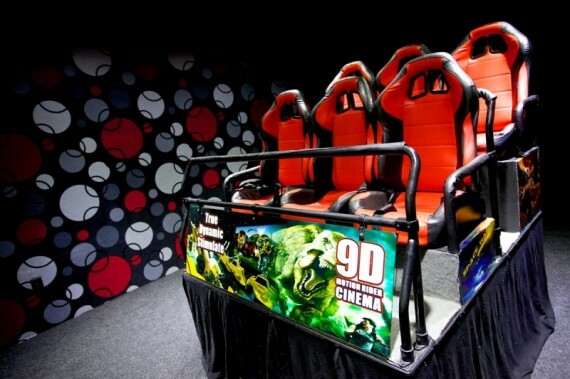 It also includes a large “war” room with air-powered guns that shoot foam balls. We couldn’t miss out the 5D cinema. It is a bit of a rip-off though. You pay 110czk per person and it lasts around 11 minutes although they say it’s 15 min. You can choose 2 different movies that are listed on the wall. Watch out - the pictures do not sometimes match the content. For example, my boys wanted the 5D car race… so on the picture we have chosen a movie with cars. To our surprise it was a floating boat race and wasn’t very exiting. We went to this cinema 3x and the best movie was the Desert Race in Star Wars type space ships. We avoided the Zombie Movies and Disastrous - so am not sure what they are like. You can also buy the tickets to the cinema on-line, on their web for 99czk. This is the only place in Prague with not only huge Indoor attractions but also a big outdoor playground with different bouncy castles. At least 5 of them! I wasn’t expecting this outdoor space when we first got there and it was a nice surprise. They have 3 separate birthdays rooms but I noticed all of the parties were actually held downstairs right next to the attractions area. That probably depends on you. You can expect the kids to be gone playing most of the time if you sit downstairs. If you want to have it more private, reserve a birthday room. This is possible only with a reservation although you might be lucky and walk and manage to get the babysitter, but they told me it is safer to call 1 day ahead or write them an email. It costs 150czk for the first hour and each additional hour is charged at 50czk. This might be handy in case you wanted to nip out to the cosmetic studio LOTO that is on the first floor of the funpark. They do manicure, pedicure, hair, cosmetics and they work with PHYRIS cosmetics. You have to make a phone reservation: 776 606 860 because they do not have all the professionals in at the one time. I have been told by the staff that their contract with Zirafa Funpark is valid till the end of September 2014 and they will then decide if they will continue on. DIRECTIONS: By Public Transport: Take Metro C (red line) to Opatov then change to Bus no’s. 385, 363 or 328 to Čestlice. By Car: Take the D1 Freeway in the direction of Brno, turn off at Exit 6 (Pruhonice). Make a right hand turn at the roundabout which will take you underneath the D1 and then right at the next roundabout which leads you into the main street of Čestlice. The playground is close to Aquapalace aqua park.